A man walking his mule through San Clemente stands out pretty quickly. Green boxes on each side of the mule announce that 3 Mules is coming through town, and people can follow the man wherever he goes, as he keeps an updated online blog and social media presence. 3 Mules is led by John Sears, and he’s the archetype nomadic traveler. Stubbly white hair seasons his sun-drenched head. He wears his clothes almost like a Peruvian Sherpa, layered for warmth but loose, and his feet show the wear and tear of constant travel. Little Girl, the white and brown mule he travels with, mostly just munched on a nearby bush. On Feb. 1, Sears was walking between parking lots of businesses along Avenida Pico and to a coffee shop to charge his phone. Sears’ website describes a spiritual bond he has with the earth and its provision of mules. He’s a self-described monk in the way that he lives. Sears said he figured, at the time, if he had a mule to carry everything for him, he’d be able to travel with the same ability as the trains he’d seen before. About 34 years ago, Sears said he purchased his first mules. 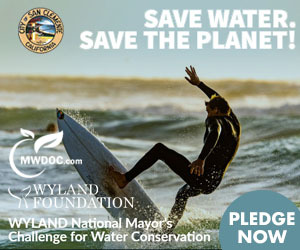 “Every year, I would go out with them and backpack around the national forests and BLM (Bureau of Land Management) lands in the summertime,” he said, adding he would have them boarded when colder months came. Working in tree trimming services until some years ago, Sears is now traveling the country along routes where he can find easy access and follow warmer weather in a migratory pattern. “I got to be around 54 years old, and I thought, well, I could get cancer tomorrow. I saved some money, and I said ‘I’ll just live steady with the mules,’” he said, adding that he’s 71 years old now. Sears said he’s not sure how many miles he’s traveled with a pack mule, but he can cover about 10 miles in a day. 3Mules was down to one mule on Feb. 1, as indicated on his blog one of the mules was not comfortable traveling in urban areas and was given away to friends exeron Jan. 11. He used to ride one of the mules when he had three. Sitting around in one place isn’t the goal for Mule. 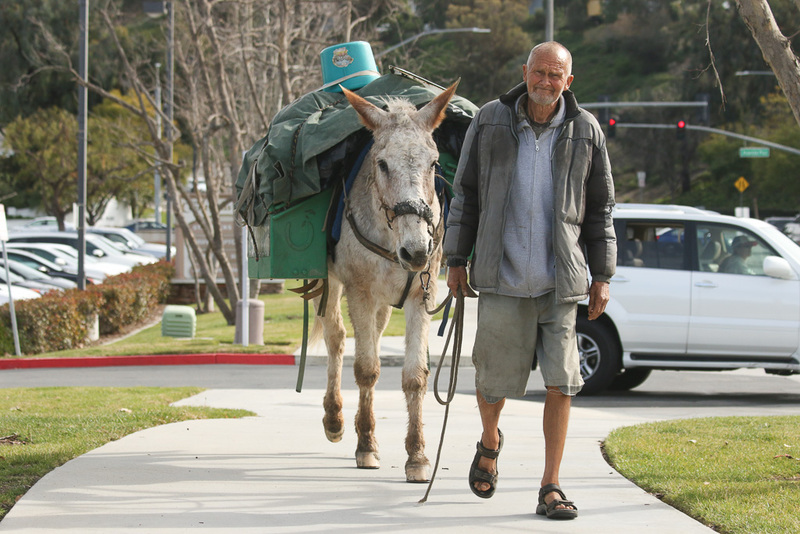 Although he seems to be enjoying himself in San Clemente, with people driving by to take a photo with him and his mule, he’s trying to get south to continue his journey. However, Camp Pendleton closed the Old Pacific Coast Highway route through today, Feb. 1, as it continues its Iron Fist exercise training with troops from Japan. There’s also the new policy that requires people who travel through the base to register, but that applies to bicycles and pedestrians; but Sears said he still won’t be able to pass through. It appears Sears tried to make this trek last year except going north instead of south. Emails corresponding with California Highway Patrol (CHP) state in February 2018, arrests were made of the 3 Mule party for not leaving the thoroughfare. Without the thoroughfare, Sears said it severely hinders his ability to move around. “They’re not providing avenues for the horse. The horse is being pushed aside, but we’re not going to watch it be destroyed,” he said. CHP responded by saying that it has no legal obligation to provide a trailer or to order Camp Pendleton to open its thoroughfares, but the department did offer alternative pedestrian trails that lead around Camp Pendleton. Sears has disputed their offers and he said he has contacted the department about this matter. San Clemente Times has reached out to CHP in Oceanside to find out whether these arrests happened. However, Sears has provided a list of citations he’s received in recent years, including one in San Clemente in 2015 where he says an officer cited him for camping in the city limits. He said in an email to the city that he had stopped because of Little Girl sustaining an injury and he wanted to seek help. Since then, the Ninth Circuit Court of Appeals in Boise, Idaho ruled last year that cities cannot expel people from camping on public property unless the city can provide a place to shelter them. San Clemente has another ordinance that prohibits people from camping in public canyons on days where fire danger is high. Sears is trying to get to Imperial Beach and then he’ll turn back north when the weather heats up a little more. Sears stayed the night as he always does: in a tent on land where he’s tentatively permitted to stay and find a safe place for the remaining mule. He carries cooking equipment wherever he goes. Just as SC Times was leaving, this was heard nearby. “Take a picture!” one man from a beige SUV called out as he was departing the strip mall parking lot. Since 3 Mules arrived, social media has been giddy about the nomadic neighbor. People are seen all over the website and platforms taking selfies with Little Girl and Sears. People can follow Sears’ journey at www.3mules.com, which has all the links to his social media, blog and other materials. Article updated for clarification at 12:30 p.m. on Feb. 4. Nice article. Sherpas are Nepalese.